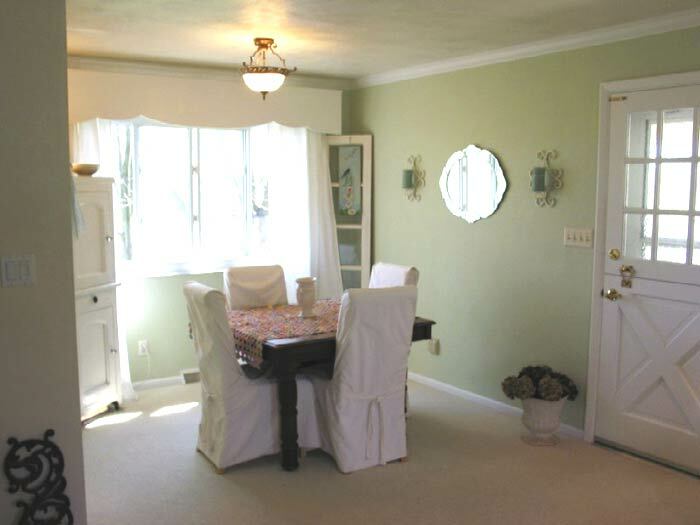 Pale green walls are a classic choice for a cottage room. They can be nostalgic, edgy or everything in between. Paired with white, as in this airy room designed by Kim Niesz of Niesz Vintage Home, they are both fresh and charming. 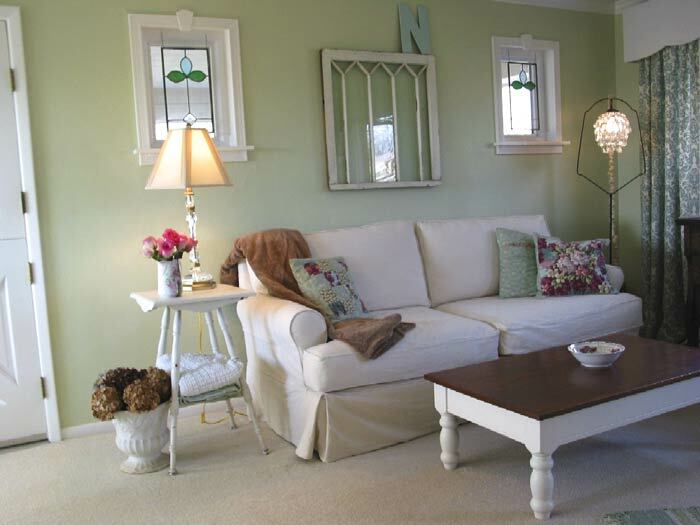 Kim's room is built on the base of the pretty pale green wall color, in this case, "Sea Drops," by Glidden. With white and the additions of pink and yellow, it is a sweet combination reminiscent of 1930's quilts. What Kim does brilliantly here is give this classic updated flair by pairing it with a modern blue and brown color scheme and adding unusual accessories and contemporary prints such as this crystal pendant lamp and the graphic blue and white curtains. What, if anything, inspired you to choose green for the room?I have always considered green like a neutral. Love it. It seems to be the one color that creeps into every room in the house. Did you consider any other colors before choosing this one?Last year, before the housing market tanked, we were looking to sell this house, so I wanted to make the color scheme as neutral as possible. I choose a basic tan for the living and dining room. It was even called "Practical Tan." Well, after living with that color for two months, I was ready to throw myself under a bus. It was so depressing. I like tan walls in other homes, but I just couldn't live with it. It just seemed so drab. I needed something different. I wanted a fresh, clear green...nothing muted. I knew I would be using an ocean blue with it, so Sea Drops sounded like a good choice. At first, my husband thought it might be a little too pastel, but I really liked it. I think it allows the other colors to stand out. I love how the bright yellow of the vintage pillow adds a pop against the cool green. Once you knew you were going to choose green, how did you pick this particular paint color?I brought home many, many paint chips. I usually buy small pints or samples of several colors to see what they'll look like at different times of day, but I don't think I did that with this one. We painted the room, I liked it, and I was done. Of course, after the depressing tan, I think I would have welcomed just about any color! All of your decor in here is so charming. Where did you find everything?The couch and chair are from the Jaclyn Smith Home collection at Furniture Fair. The coffee table was a sale item from Value City furniture 15 yrs ago! It has been dark green, red, and now cottage white (how's that for stretching a dollar)? The crystal pendant is a recent find from the mall. Pillows are vintage fabrics from my collection paired with a green fabric by Waverly ($1.00/yard on clearance). The armoire is from my Grandma's attic. The windows are from an antique store in Brown county many years ago. The yo-yo quilt was a gift from my mother-in-law. And the best part, the drapes: I made them myself using the most wonderful linen fabric. It's a lovely ocean blue damask print linen by Chris Stone. I found it at Hobby Lobby on sale. Still expensive, but worth it. There you have it. A charming, updated cottage classic. I hope you love it as much as I do! About The Designer Kimberly Niesz is a vintage fabric collector and dealer who creates a comfortable space in her tiny home by incorporating pieces of the past in new ways. Her business, Niesz Vintage Fabric specializes in unused vintage fabrics (barkcloth, chintz, and quilting cottons) from the 1930's-1960's, but also carries vintage linens, feedsacks, trims, buttons, and curtains. You can find her at her shop, Niesz Vintage Fabric or at her blog, Niesz Vintage Home. Photos in this article are Copyright ©2008 Kimberly Niesz and are used by permission. Are Vintage Fixtures Right For You?